Is anyone else in awe there’s only one week until Christmas?! The leaves are gone, snow has come, and Christmas cookies are currently in the oven. In honor of the one week mark, today I have a cookie recipe that is most reminiscent of Christmas for my brother. I’ve never actually had a vegan version of a Peppermint Candy Cane Cookie. So, last night I hit my mom’s old cookbooks. The chosen recipe?! Martha Stewart’s Candy Cane Cookies circa 1989. Veganized, of course. If you have a cookie swap coming up, I highly recommend making these Peppermint Candy Cane Cookies. Not only does the recipe yield TWO DOZEN cookies, but the amount of effort for a beautiful cookie is less than you may perceive. This recipe calls for only eight ingredients. Instead of regular butter I substituted Earth Balance vegan butter. I also used ¼ cup of soy milk instead of one egg. The rest of the ingredients are quite simple, they include the following: all-purpose flour, organic powdered sugar, vanilla and peppermint extract, a dash of salt, and some vegan pink or red food coloring. For extra pizazz there’s always the option to add crushed up peppermints. Using a stand-up or hand-held mixture, cream the vegan butter with sifted powdered sugar until fluffy. Then add soy milk, vanilla, peppermint, salt, and sifted flour. Mix until a dough is formed. Divide the dough in half. Stir or mix the food coloring into one half. Wrap both pieces of dough with plastic wrap and set in the freezer for 15 minutes. Preheat the oven to 350 degrees and line baking sheets with parchment paper. Shape a teaspoon of plain dough into a 4-inch-long cylinder. If you want to get technical like I did, don’t be afraid to use a ruler. Do the same with the red dough. Twist both pieces together and bend into a cane shape. Repeat with the remainder of dough. Set the cookies 1-2 inches apart on the baking sheets. Bake for 15 minutes and then remove from oven. 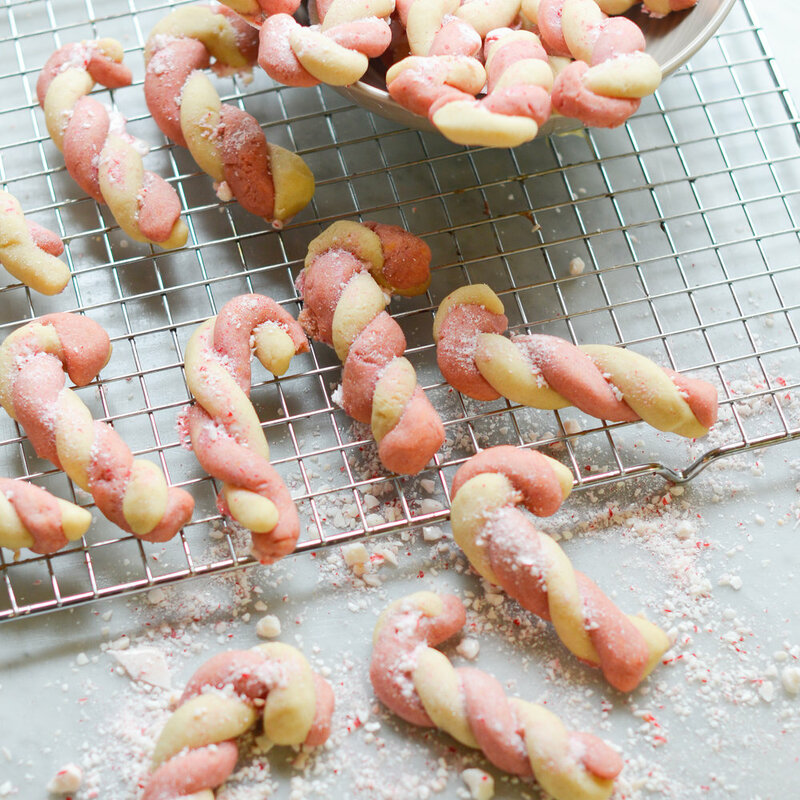 While you wait, crush up candy canes. When the cookies are hot out of the oven, top them with the candy so it slightly melts. Let them cool on the baking sheets for 5 minutes before transferring to a wire rack. Note: I used Color Kitchen’s food coloring. They have multiple options including a food coloring meant for baking, which would definitely work for these cookies. I only had one option at my local health food store. So, I resorted to the product meant for frosting. It did work as you may see by the photos. For reference, I used the entire pink packet, which consists of maltodextrin and beet powder. If you use a liquid food coloring I recommend ¼ tsp or until you reach a desired color.